Bexar County Judge Nelson Wolff speaks about the growing tech industry in San Antonio in 2016. A group of San Antonio officials gathered on the front steps of the Bexar County courthouse Friday morning to publicly urge Gov. Greg Abbott to veto Senate Bill 4, the controversial legislation widely known as the “sanctuary cities” bill. Sen. José Menéndez (D-26), Bexar County Judge Nelson Wolff and members of the County Commissioners Court, District Attorney Nico LaHood, members of City Council, San Antonio Police Department Chief William McManus, and Bexar County Sheriff Javier Salazar spoke out against the bill, saying that they believe it would diminish trust between local law enforcement and the community, could lead to racial profiling, and will not increase safety in San Antonio. The Texas Senate on Wednesday voted 20-11 to accept the House’s version of Senate Bill 4, legislation that would ban “sanctuary” jurisdictions in Texas and allow police to inquire about the immigration status of people they lawfully detain. 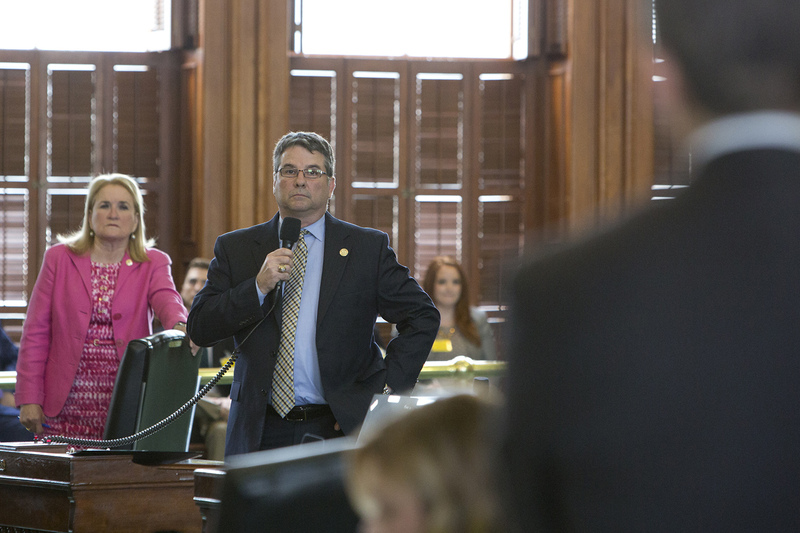 The bill now heads to Abbott, who declared the legislation an “emergency item” in the early days of the legislative session and is widely expected to sign it. The legislation makes sheriffs, constables, police chiefs and other local leaders subject to a Class A misdemeanor if they don’t cooperate with federal authorities and honor requests from immigration agents to hold noncitizen inmates subject to deportation. It also provides civil penalties for entities in violation of the provision that begin at $1,000 for a first offense and climb to as high as $25,500 for each subsequent infraction. The bill also applies to public colleges. But the final version also includes a controversial House amendment that allows police officers to question a person’s immigration status during a detainment, as opposed to being limited to a lawful arrest. Democrats and immigrant rights groups argue this makes the bill “show-me-your-papers”-type legislation that will allow police to inquire about a person’s immigration status during the most routine exchanges, including traffic stops. Before Wednesday’s vote, some lawmakers were still hopeful the bill would go to a conference committee where lawmakers from both chambers could strip the amendment from the bill. But during a floor debate Wednesday before the measure was approved by the Senate, the bill’s author, state Sen. Charles Perry, R-Lubbock, said that the bill doesn’t require that officers ask a person’s immigration status. However the language does leave the door wide open for officers to make such inquiries if they feel the need during routine stops. The amendment to allow local police to ask about immigration status during a detainment was added during a 16-hour House debate by Tyler Republican Matt Schaefer, who told the Tribune last week that he had been willing to pull the proposal if Democrats had agreed to limit the debate of the bill on the House floor. But whatever deal was allegedly in the works fell through and Democrats could only sit and watch as the amped-up version of the bill passed the lower chamber. Abbott and Lt. Gov. Dan Patrick have said the bill is about rule of law and making sure that criminals who are also in the country illegally should be deported before they are able to commit more crimes in this country. But several law enforcement leaders have said the bill will erode the public’s trust. Abbott’s signature on the bill will cap his quest to ban “sanctuary” cities that made national headlines after Travis County Sheriff Sally Hernandez announced in January she would limit her jail’s cooperation with Immigration and Customs and Enforcement. Hernandez later amended her policy but not before Abbott withheld state grant funds from the county. Late Wednesday, Abbott celebrated the Senate’s vote. “The Texas sanctuary city ban wins final legislative approval. I’m getting my signing pen warmed up,” he posted on Twitter. It’s unclear however, if Abbott’s signature on the bill will be the end of the conversation. Several lawmakers have said a lawsuit to stop the implementation of SB 4 is very likely and cite several reasons, including legal questions surrounding the federal preemption of immigration laws and whether ICE detainers are voluntary. Before the final vote, Perry seemed to acknowledge as much. “We will let the court systems figure this out,” he told state Sen. José Menéndez during a lengthy back-and-forth about probable cause. At least two dozen protesters on the grounds of the Texas Capitol were charged with misdemeanor trespassing, the culmination of a day-long sit-in in protest of the “sanctuary” jurisdictions bill. Rivard Report reporter Camille Garcia contributed to this report.